The Nazi invasion of Luxembourg began on 10th May 1940. The government chose to go into exile, moving to London and the US. This commitment to the allied cause was central to Luxembourg maintaining international recognition for its independence after the war. However, the German occupation ended Luxembourgish independence until 1945, with the country incorporated into the Reich. Over the summer of 1940 all state structures were suppressed, with the country coming under direct German control. A vast programme of propaganda sought to encourage Luxembourgish loyalty to the Nazi regime, but these efforts were met with increasing popular hostility. A census in 1941 showed the depth of feeling. When asked three questions about national feeling, ethnicity and mother tongue, overwhelmingly the population replied “Luxembourgish”. This act of passive resistance showed the occupying forces the depth of their desire to reject assimilation. Many Luxembourgers were sent to their death, forced to fight in the German Army. This forced enrolment was at the origin of multiple strikes within the country. On 30th August 1942 obligatory service in the German army was introduced in Luxembourg. Strikes broke out across the country immediately in protest, but the regime took a tough line: installing marshal law and executing 21 strikers. By the end of the war, no fewer than 10,211 Luxembourgers had been called up to join the Wehrmacht, but more than a third refused the draft, either going into hiding or into exile. The occupiers responded with terrible force, with further executions and deportations to prisons and concentration camps. The oppression was harsh. Luxembourg’s Jewish community were, of course, particularly vulnerable. 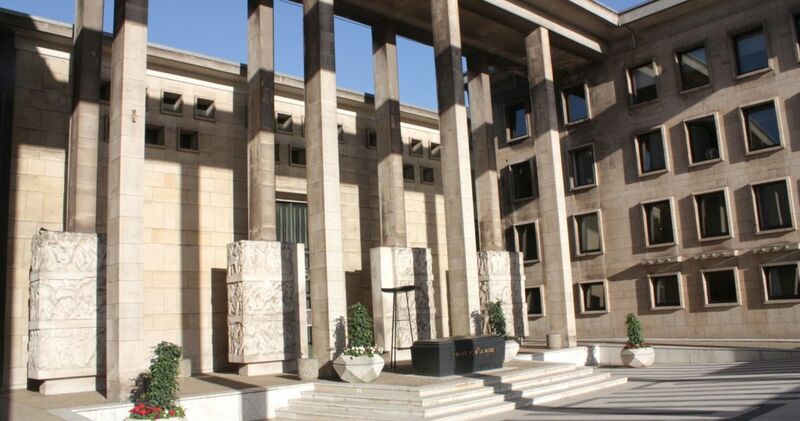 Of the 3,700 Luxembourgers of Jews resident in the Grand Duchy pre-war, 1,200 were murdered in the Holocaust. To give this horror immediacy for current and future generations, German artist Gunter Demning created “stolpersteine”, literally “stumbling stones”. These brass plates are set in the pavement near the homes of people killed by the Nazis across Europe. They are inscribed with victims’ names and brief biographical details. Most are dedicated to the memory of Jewish people sent to extermination camps, but we are also reminded of murdered political opponents, homosexuals, military deserters, disabled people, travelling people, and more. These memorials are to be found across Europe, and there are 96 stolpersteine in the Grand Duchy in Belvaux, Differdange, Ettelbruck, Esch-sur-Alzette, Grevenmacher, Mondorf-les-Bains, and Remich. This museum uses photos, objects and art to tell the history of the 1940-1945 period from the point of view of the people who combated Nazi oppression. There was both passive and active resistance, including strikes, as well as desertion and refusal to be drafted. Also described are the armed resistance and Luxembourgers who served in the allied military. The liberation is also well documented. Special attention is paid to the nature of Nazi oppression, the concentration camps, and the often tragic fate of Luxembourg’s Jewish population. Temporary exhibition areas feature a range of subjects on Luxembourg and Europe pre and post war, as well as during the occupation. We are also asked to reflect on how the lessons from this period can inform us about current ideas of human rights and general education. Groups can visit any day of the week from 08.00 on request. Free entry. 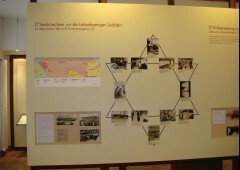 Many thousands of Luxembourgers were sent from the homeland by the occupying Nazi authorities. 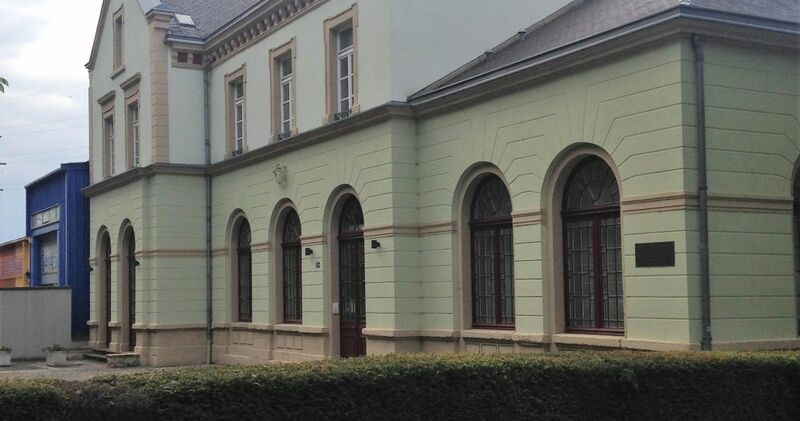 Hollerich railway station was a main departure point for Jews being sent to death camps, young men forced to fight in the German army, and political prisoners headed for concentration camps. 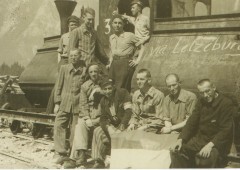 There is museum exhibition space at the station telling the story of these victims of Nazism. Opening times: Tuesday to Friday 09.00 - 11.30 and 14.00 - 16.30. Make an appointment for a group visit or guided tour. Wiltz is known a Martyred City due to the heroism and self sacrifice of its inhabitants during the 1940-1945 German occupation. Obligatory military service in the German army was imposed on Luxembourg’s youth, following the orders of the Gauleiter Gustav Simon on 30th August 1942. The following day opposition protests and strikes broke out across the occupied country. Many of these demonstrations were spontaneous, but they were also encouraged by the resistance. The strike was particularly strong in the northern town of Wiltz, beginning on 31st August in the “Ideal” tannery. The German response was harsh, with 21 patriots (20 Luxembourgers and a German, including four teachers and two local civil servants) being executed at the Hinzert concentration camp in Germany. As well, more than 200 people were arrested, with over 180 secondary school children deported to Nazi re-education camps. Also, several family members of political activists were deported to easterly points in Reich. The National Strike Monument was erected in 1956 to pay homage to the victims of this tragic, painful period of Luxembourg’s history. 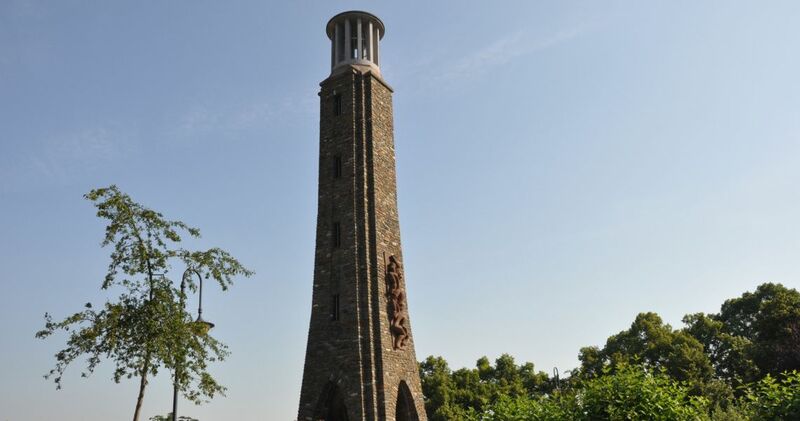 Each year, on 31st August, a solemn remembrance ceremony takes place here. The monument was designed by the architect Roger Wercollier, featuring reliefs by his brother, the sculptor Lucien Wercollier. Lucien had himself been deported by the Nazis for participating in the strike, and refusing to conform to Nazi rules on artistic “purity”. The relief sculpture features the future King David with the sling he used to defeat Goliath, together with a figure representing liberation. The latter appears to take energy and inspiration from David’s victory against the odds. A second relief portrays strikers being executed, with the tragic drama conveyed figuratively. Rather than showing this turmoil in detail, the figures are designed to convey their message when viewed from the ground. The cultural path (red) features 25 curiosities of which about half are in the lower town. 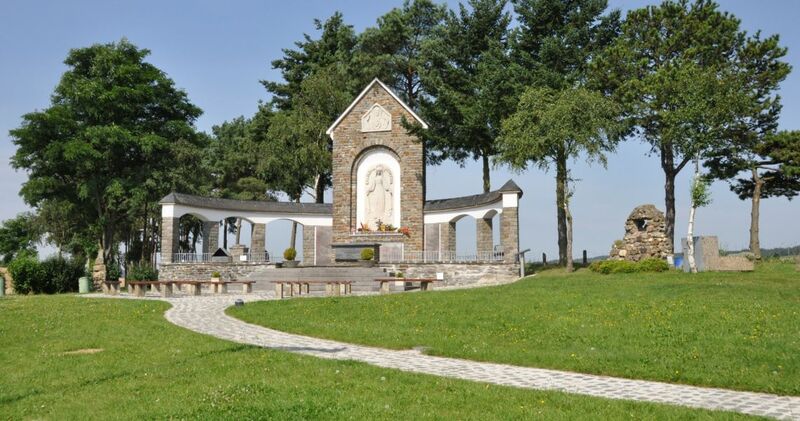 The path is around 4.5km (2.8 miles) long, with 90m (300 feet) elevation between the low point (310m) near the Niederwiltz bridge, and the high point (400m) at the Our Lady of Fatima sanctuary at Baessent. Here you will find a geological stations-of-the-cross as well a monument to Our Lady of Fatima. The museum is dedicated principally to terrifying experience of the Battle of the Bulge, fought between 16th December 1944 and 21st January 1945, the date when Wiltz was finally liberated. Photos bring to life the heroism of soldiers and civilians that contributed to the final liberation of the Grand Duchy and the northern Oesling region. As well, extra insight is given by the documents, paintings, uniforms, and military hardware on display. Explaining the suffering of combatants and local residents was the key goal of the museum’s curators. Extensive loss of life and property were inevitable in this brutal fight for freedom. Models are used highlight some of the key phases of the war as they affected Wiltz: the Battle of the Bulge; the period before conscription was introduced from 31st August 1942; the strike and martydom of six local citizens; the liberation on 10th September 1944; GIs meeting Wiltz residents; St Nicholas day with GIs; the start of the Battle of Bulge (including the 28th Infantry Division preparing for combat and the adversaries around Schumann’s Eck; the end of the battle on 21 January 1945, the promise taken by the priest and inhabitants in the cellar of the priest’s house. Together, the exhibits explain to visitors why Wiltz is called a “Martyred City”. Opening times: Monday to Saturday: 09.00 - 12.00 and 14.00 - 17.00 | July to August: Every day 09.00 - 18h00 | For groups of 10 or more: open on request. For more Information and to reserve guided tours: mobile +352 691 811 260 or e-mail : vicsch@pt.lu. An audio-guide in four languages is available. The fighting about 10km (6.2 miles) to the west of Wiltz had a decisive impact on the battle for Bastogne, a strategically important town in Belgium. The resistance shown by the 28th Infantry Division slowed considerably the Wehrmacht’s progress towards the besieged Belgium town. This bought time that enabled General Georges S. Patton’s regiments and the British and US air forces to bolster the defence of Bastogne and eventually break its encirclement. During the fighting, several residents of Wiltz took shelter in the cellar of a presbytery. Their prayers to the town’s patron saints were answered when they were unharmed when the fighting eventually came to an end. During their period in hiding, they made a commitment that if spared by the conflict, they would express their thanks to God with an annual pilgrimage. Ten people made this promise in writing on 13th January 1945 on the bottom of a tub of sauerkraut. The mayor and the church council added their support two days later. On 11th September 1947, the statue of the Virgin of Fatima was displayed at the place known as “op Baessent”. This was part of the statues’ European tour. A pilgrimage sanctuary was eventually built on this spot on 1951 (based on plans by Lull Marth), being consecrated in 1952. It features large relief sculptures of the Sacred Heart of Jesus and the Virgin Mary by the artist Aurelio Sabbatini. Underneath is the text of the 13th January 1945 promise. The sides of the monument feature the names of the 108 residents of the Niederwiltz parish who died in the war. Sabatini later created the stations-of-the-cross that also features on this site, and this was inaugurated in 1958. This site is visited by nearly 20,000 pilgrims each year.